As many as 60% of women experience memory lapses in their forties and early fifties, during the stages of menopause or postmenopause. Inability to recall words and numbers, difficulty concentrating, and forgetting appointments are all common indicators of the symptom. Perimenopause brings with it a number of difficult symptoms, but memory lapses are something that can really make a woman feel as though she is suddenly losing her mental abilities. There are some select herbal teas can help you boost your brain function and reduce the severity of menopausal memory lapses. 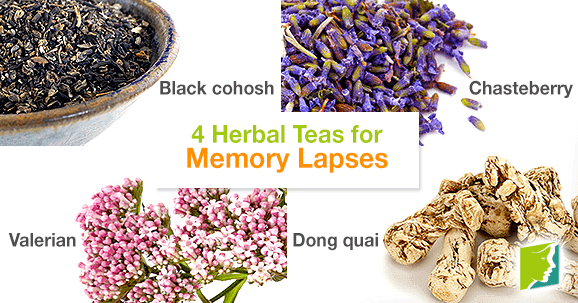 How Can Herbal Teas Help Memory Lapses? Menopausal memory lapses are generally brought on by hormonal imbalances in the body. Estrogen has a significant influence on brain function, affecting the vascular and immune systems. This hormone enhances activity in the hippocampus and other areas of the brain, as well as the brain's ability to form new memories. During perimenopause, when hormonal changes occur in the body, a decline in estrogen levels can therefore hinder the way a woman learns and consciously recalls new information. Black cohosh is an herb long associated with relieving menopause symptoms. A significant phytoestrogenic source, black cohosh tea could reduce memory lapses when consumed on a daily basis. Another source of phytoestrogen, dong quai herbal teas could have a positive effect on memory loss. Although scientific studies of its effectiveness are ongoing, dong quai has been used for centuries to relieve a number of menopausal symptoms. Valerian root can be infused with water to make a medicinal herbal tea for memory loss. It is another phytoestrogenic herb, and it also has mild sedative properties, which can relieve anxiety and stress - factors that can hinder the cognitive functions in the brain and contribute to memory lapses. Chasteberry is also a phytoestrogenic herb that could help to regulate memory lapses driven by estrogen decline. Unlike most other menopause symptoms, memory loss does not have outward indicators. This can make it difficult to monitor the improvement of memory, but keeping a record of memory lapse incidents will help you keep track of the process. Try to be patient, also; these herbal remedies aim to regulate imbalances in your body naturally, over time, which means that it may take a while to notice significant improvement in your memory. In the meantime, keep your mind active with regular brain-stimulating activities, like reading, playing board games, or learning a new hobby. For more information about memory lapses and how to treat them, follow the links below.